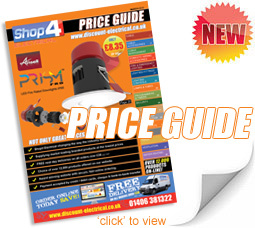 Our latest 48 Page PRICE GUIDE was launched in March 2019. 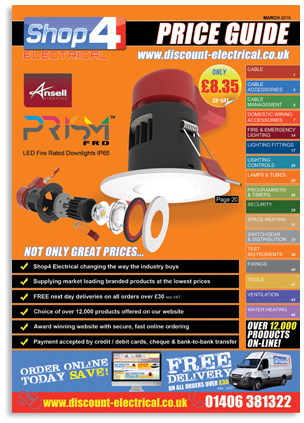 From cover to cover we offer a range of everyday products from leading brands representing all that is best in today's electrical markeplace. All products are heavily discounted away from manufacturers' trade prices, even for the smallest value purchases - allowing you to save money from day one. The catalogue is available to browse electronically by clicking on the image below. Once loaded, you can quite literally flip the pages of the online PRICE GUIDE and when you find the product(s) you wish to purchase, simply click and it will take you to the relevant page on the website - allowing you to order. SHOP4 ALL ELECTRICAL - CHANGING THE WAY THE INDUSTRY BUYS.